PARK HILLS, Mo. – With spring upon us, Mineral Area College is gearing up for the upcoming semester of summer classes. The summer semester begins June 3 and open registration is currently in progress. Summer classes are popular because of the convenience, expediency, and affordability the four-, six-, eight-week, and online sessions offer students, especially those returning to their hometowns for the summer. Students at 4-year universities often look for accelerated classes that are less than half the cost of university tuition. There are better opportunities for smaller class sizes and one-on-one attention in the summer semester. Additionally, summer classes are a great way for MAC students to ensure that they complete an associate degree in two years. They can “catch up or get ahead” by continuing coursework through the summer months. Summer classes are particularly appealing this year because of surplus Federal Pell Grant funds. Typically, students who qualify for Pell grants may only use funds that remain after the fall and spring semesters. However, this year, students who qualify will receive full Pell funds for 6 credits of summer classes. The eight-week summer semester begins June 3 and ends July 29. Four- and six-week classes are also offered in the summer and begin at various times during the semester. Many classes are offered online and during evenings. 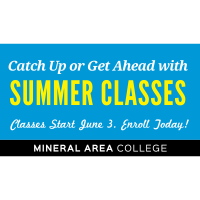 The summer schedule of classes is available at https://mineralarea.edu/current-students/registrationregistrar/. To schedule an advising appointment, students may call (573) 431-4593 between 8 a.m.-6:30 p.m. Mondays through Thursdays and 8 a.m.-4 p.m. on Fridays. First-time MAC students should apply online and can call the Admissions Office at (573) 518-2228 with questions. Arrangements for financial aid and payment of tuition and fees should be made at the time of registration. Call the Financial Aid Office at (573) 518-2133 for assistance. The staff at MAC is ready to assist you enroll and hopes to see you this summer!